It would be great to be a fly on the wall at Nokia at the moment. As a company, it's clearly impressed with the success of the N95, and rightly so. So, its successor, the N96, is also a decent handset, as it builds well on the previous model. And it has shiny, rounded edges too, in order to bring the mandatory 'ooohs' from users. And this is a theme Nokia has clearly warmed too with the previous N81, and now the 6600 Slide. Shiny black housing? Check. Rounded edges? Check. Random lights on the keys that glow futuristically? All present and correct. We're looking at 3G, a 3.2MP camera, a 2.2 inch display, Flash lite support, all manner of media file playback and inbuilt Opera Mini browser. 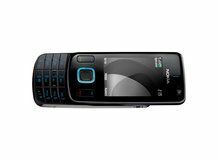 The 6600 looks to be a clear marker the mobile phone mid-range is getting pretty feature rich, as it holds some models that would have been pretty high end just 18 months ago. It has recently passed the FCC checks after being unveiled earlier this year along with the sister 6600 Fold (can you guess how that one is different?). Apparently prices are likely to be around €250 (around £195) for this device, which is likely to be available soon.